Following the Israeli government's expulsion of Jews from Gaza, one person concluded, "The idea that a secular government could possess sanctity and be embraced by the religious as the "a tchalta de-ge'ulah" [beginning of the redemption] went down like the Titanic." As a Jewish settler who lives in the "West Bank", how have you seen Religious Zionism evolve since the Disengagement? Since the Disengagement, much of the Religious Zionist community has realigned its positions and understanding of "atchalta de-ge'ulah" with respect to the State of Israel and it's institutions, though each sphere has it's own unique ramifications. To preface, there are still those who have not changed their thinking in the slightest; those include R' Shlomo Aviner and his followers, who make no differentiation between before and after the Disengagement and adhere to the position that there is inherent holiness to the State and it's institutions, regardless of the decisions of this or that secular government. Their worldview ascribes inherent holiness to the IDF, regardless of the directives given to it by the government -- and refusing orders is considered taboo at (almost) all costs. I know people who would call the police if they heard anyone even discussing the idea of refusing orders to evict Jews from their homes. That said, there are many "Religious Zionists" (myself included) who feel much more jaded when it comes to respect for the government. Some people no longer stand up for the "prayer for the welfare of the State of Israel", or stand up only after the part that "blesses" the political leadership of the State (they stand for the part where the armed forces are given a bracha). Ad-hoc changes are sometimes inserted; i.e., "bless the IDF WHEN they are protecting the land" -- the word "when" is added to differentiate between protecting the land and fulfilling the political edicts of the government which could include evicting Jews from their homes, destroying Jewish communities, releasing terrorists, and using administrative detention (withholding due legal process) against right-wing activists as a means of stifling political criticism. Instead of "protect the State with Your kindness", a cynical replacement is sometimes stated "protect the State from it's leaders, ministers and advisers." Regarding the IDF, over 40% of graduating combat officers are currently from the "religious" camp and the number of religious soldiers in elite units continues to rise. However, this trend may be peaking as some religious teenagers have begun to have second thoughts about military service. Why strive for military advancement and excellence when a government may use the IDF to further political policy that runs contrary to the values of Religious Zionism (Jewish education, Social Jewish policy and Settling the land)? When Roi Klein, HY'D, a Religious Zionist IDF officer from the West Bank settlement of Eli, made the ultimate sacrifice in the past Lebanon war, and died by Kiddush Hashem -- jumping on a grenade to save the lives of his soldiers, Prime Minister Olmert invoked Roi Klein's name, his actions, and the "success" of the Second Lebanon war -- to directly further Olmert's stated plan of removing Jews from the "West Bank", a plan which would include Roi Klein's young widow and orphaned children. This is a prime example of the disgust people feel for Olmert today, and the wary distrust that has grown between settlers and the army. Will a selfless sacrifice today on behalf of security for the State be used tomorrow to evict one's own family from their home? While I still recited Hallel this past Yom Haatzmaut my level of joy has diminished. The concept of "atchalta de-ge'ulah" has not gone down like the Titanic but the redemption process feels like it's velocity has slowed, the energy has gotten bogged down...and worst of all, it may have entered a phase of "hester panim". The right wing political leadership is currently stagnant, both in and out of the Knesset. Grass root organizations like Moetztet Yesha should have organized a huge rally while President Bush is in Israel now; hundreds of thousands could have attended sending a clear message of the country's loyalty to the land and Jerusalem. Instead, the lack a vocal opposition is viewed as a tried, resigned concession to the acceptance of territorial compromise. That said, the potential for redemption through the State still clearly exists. "If you believe something can be broken, believe it can be fixed." The birth rate of the religious and chareidi community far outpaces that of the secular one; Ariel Sharon, who led the Disengagement has 2 grandchildren, while Rav Druckman, one of the leaders of the Religious Zionist movement has over 70 grandchildren. While it may take time, the religious community will eventually be the majority in Israel. And yet, there is a new generation of religious/"settler" youth, who have grown up in the furnace of confrontation with the authorities over the expulsions -- both physically and ideologically. Unlike many of their "tiring" parents, these youth are inspired, committed, and determined -- they will be ready to take the reigns of power as soon as the demographics enable them to. 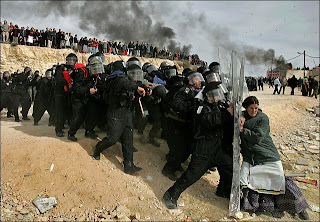 It is not unlikely that a 14-year-old girl who sat for months in the Masiyahu prison for protesting the expulsion, will be eventually be our Prime Minister; teenagers who had their arms and legs broken by police brutality in Amona will be the government ministers of the Police, and the IDF soldiers who refused orders to evict Jews from Hevron will be chiefs of staff. התנערי מעפר קומי לבשי תפרארתך עמי - Shake off the dust and arise, don your clothes of nobility my nation! We need to accept with patience that it may take time to return to the direction we firmly believe is the correct one. "Now" organizations are the current fad, such as "Peace Now" -- we have been pummeled with the message of instant gratification requiring everything "now." Patience! We will continue settling Eretz Yisrael despite the hardships, and while the setbacks may be depressing -- my children are well aware that if I personally don't merit seeing Gush Katif rebuilt and thriving with Jewish communities, then they are responsible to return and rebuild. If not them, then their children. If I forget thee Yerushalayim, may my right hand lose it's skill. We waited close to 2000 years for Yerushalayim's rebuilding to begin. We waited for 19 years to rebuild the destroyed communities of Gush Etzion after 1948, and we rebuilt them. 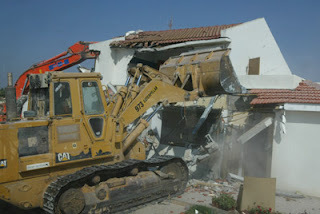 In time, Gush Katif and the Northern Shomron communities will also be rebuilt. (ולא ינטשו עוד מעל אדמתם אשר נתתי להם, אמר ד' א-להיך (עמוס ט', ט - And never again will you be uprooted from your land than I have given you, said Hashem, your G-d. I admire the idealism and dedication of religeous zionists. But you guys are making a HUGE mistake! You're using your idealism in a very, very unwise and DANGEROUS way. It's not much different from those jews in Europe who idealistically listened to their rabbis and stayed in Europe before the holocoust... It only got them into the gas chambers. Same can happen to you C'V if you don't wake up! Forget your ideology for now. Go back to the Torah and see what it sais about geula, without being brainwashed by your rabbis. With very few exceptions, your rabbis are brainwashing you, and they'll be responsible for your blood C'V! Yes, all of Eretz Yisrael will be rebuilt, the Torah has promiced that, but it will not be in the name of the state of israel. And before that happens, all I can suggest for anyone that's willing to listen is to learn some wilderness survival skills. Your leaders are out to kill you, your rabbis are making sure you won't fight too much, and no politics will save you. Why is there a rubber band over the tefillin? What kind of disrespect is this in Eretz Israel?? Commenter 1: Have you ever heard of the Vilan Gaon's talmid muvhak R' Yisrael Mishkalov (author of Pe'at HaShulchan)? He was one of the Gra's talmidim who moved to Tzfat in Eretz Yisrael in 1810. Why don't you read up about how difficult it was for him, and his steadfast devotion to living in EY. Things were never really simple, but now they are even less so. I'm sure I'm not the only one to make more of a point differentiating between G-d's actions and man's. That mean that I thank G-d and have no problems saying "Hallel" on Yom Ha'atzma'ut, but I think it's a moral imperative to oppose all evil decrees, acts etc. of the government. Thanks for this inspiring post! Jameel and the so-called "settlers" are the most idealistic religious Jews in the world today, and they make me ashamed to realize how cynical and withdrawn I have become since Israel's leaders started the National Suicide Process and turned with even greater ferocity against religious Jewish life in our land. We understand these things to be the chevlei ha-moshiach, and remember the words of Chazal, "Let him come -- but let me not witness it!" To me, the sanctification of the secular Israeli government etc. is theological madness -- pure dimyon. But there is still a ray of hope. I once heard that Rav Avraham Sternhartz once told Rav Gedaliah Koenig: "The medinah (secular state) is indeed a klippah ('husk,' something external and unholy) -- but it is a klippah that also protects the fruit as it develops..."
Ribbono Shel Olam, isn't it time already? Jameel: I did not hint at leaving EY! Not at all! I myself live here B'H and am determined to stay at all costs (may Hashem strengthen our resolve). I was not saying that you are wrong in your devotion to EY. That is only commendable and I wish all jews would have that attitude to E'Y. I was saying however that your attitude to the state is well... I don't know if I can say it's wrong, but it's definitelly wrongly applied... And that's very dangerous. I see this as no different to Meshichistim who shout "yechi adonenu" making fools of themselves and giving a bad name to their cause. They're good jews but they got cought on one idea (that the Rebbe said he's moshiach) and they APPLY this idea in a wrong way, to the point of absurdity... So too you guys (or many of you) got cought on the idea that the state is holy (I assume such a thing can be extracted from R' Kook's writings) and you APPLY IT IN A WRONG WAY to the point of absurdity... You understand what I'm saying? Reiterating Tspr's point, seriously Jameel yours was a great piece. thank you. As a Baal Teshuvah I have to confess I am not as learned as some of the authors here... and the arguments against and for religious zionism escape me. as a people, it does not seem we have achieved the level of perfection we need to merit the Holy Land - and these blogs are proof of it. And yet H" has given us miracle upon miracle to merit being in the Land. did the Vilna Gaon see such miracles in his time? If after intense recitation of Tehillim, hours of Torah story, strict adherence to Taharat Mishpacha - the secular government still succeeds in stripping Gush Katif etc, you can't blame the government anymore, you have to cry and beg H' for forgiveness; then the tinuks will be confused and will likely rethink what they are doing. Hayinu - nice! AD MASAI!! DAIAYNU! 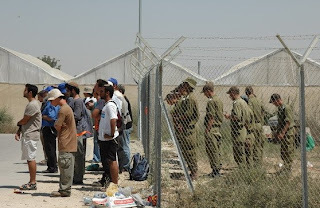 there are still those who have not changed their thinking in the slightest; those include R' Shlomo Aviner and his followers... Their worldview ascribes inherent holiness to the IDF, regardless of the directives given to it by the government -- and refusing orders is considered taboo at (almost) all costs. I know people who would call the police if they heard anyone even discussing the idea of refusing orders to evict Jews from their homes. And such people call themselves "shomrey mitzvoys"? For me it sounds like an attempt of making a kosher khazir. I know some people who stopped saying Hallel on Yom Haatzmaut, even thought they did it before. This is because they don't respect such state anymore, so what to say Hallel for? Why do we say Hallel and celebrate Chanuka -- an event from thousands of years ago? The Chashmonaim from Chanuka eventually became an evil force and did much damage to Judaism (and the Chashmonaim were eventually all killed). The brave Maccabim; Yehuda, Yochanan, Elazar -- were ALL KILLED fighting. And yet, we celebrate Chanuka, even for a brief return of Jewish sovereignty to Eretz Yisrael. Not reciting Hallel is a rejection of gratitude to Hashem's generosity of allowing Jewish sovereignty in Eretz Yisrael. OK, so the government is evil; so they do horrible things; the fact that we have the potential to do things right is what we need to give thanks for. Duvid: I was saying however that your attitude to the state is well... I don't know if I can say it's wrong, but it's definitelly wrongly applied... And that's very dangerous You need to explain what about my "attitude to the state" is that's wrong. Do I love the government? No. Do I love the police? No, actually I despise them for the most part. Do I love the IDF? I'm wary of it, because of the bad they can do. Yet they are the ONLY army we have to protect the country. Learning in yeshiva alone will not protect us. An army alone will not protect us. I volunteer for the IDF to protect my family, community and Eretz Yisrael. The minute I get an order which conflicts with those goals -- is the minute I will refuse orders and go to military jail. Thanking Hashem for giving us a country with the potential for a proper Jewish State is the least we can do. What "point of absurdity" of are you referring to in my relationship to the State? Are you against IDF service? Do you think we dont need to give praise to Hashem for the return of Jews to Eretz Yisrael? For the unification of Yehuda, Shomron and Yerushalayim? Jameel: Ok, let me explain myself. When I said absurdity I was reffering more to the likes of Aviner, not people like you who have the sence to refuse orders when needed. Pehaps I should've made that clear. However, here's a very important issue. You still have an atttude to the state which is very unhealthy. Your attitude is basically "we're very unhappy with what the state does, but this is still OUR state, and OUR army..." You still continue praying for it, albeit with some changes... I think this is very dangerous. You should realize that the state is not a jewish state, period. The army is not a jewish army. About army service, yes, I think it should be encouraged for those who have enough sence to refuse orders, but not because it's "our" army. Treat is like the Russian or the US army, which happens to be a good place to get army training (always important for the jews) under favorable halachik conditions (kosher food, Shabbos, etc. ), and which happens to protect our people most of the time (but it can turn against them very easily). Look, my grandfather joined the Russian army to kick the c... out of germans during WW2. I think Zahal should be treated no different. Just consider this: There's A REASON why people like the Satmar Rav, the Lubavitcher Rebbe, the Chazon Ish were opposed to the state... Yes, I know, you follow R' Kook, but that should not be to the exclusion of the forementioned sages! Think about it, they do have what to teach you about the state, and we better start taking their message seriosly now. Duvid: I would view your position as the extreme position here. Now that the state is here, do you advocate that it be dismantled? ASJ: Do you consider Satmar and Chabad positions extreme too? I think my position is no different, except that I give value to yishuv EY, and to the mesirut nefesh and dedication of the mitnachalim. Duvid: While it known that the Rebbe Rashab of Lubavitch made some statements against Zionism, I don't recall the last Lubavitcher Rebbe being vociferous about this issue. 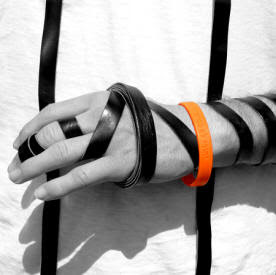 On the off chance that Spiritual Dan was not joking but was simply uninformed, the "rubber band" over the tefillin was a bracelet worn to show opposition to the removal of the Jewish residents from Gush Katif. Orange is the symbolic color worn by opponents of the hitnatkut/withdrawal. Shira: I still wear my orange wristband daily. To work, to shul, and even when I do IDF milluim... Many people still wear them. ASJ: Statements of Rebe Rashab ztz"l are very true and precise, and the last Lubavitcher Rebe ztz"l never argued with them or claimed they were wrong. He concentrated on how to slove these problems, but the theory of where they come from was always clearly known. Jameel: IMHO the comparison with Chanuka is invalid completely. Chashmonim started as tzadikim, and fell. Since they were tzadikim at the beginning, Chaza"l institued Hallel for the neys of the Chanuka. Tziyoynim began as reshoim from the very start, and in general the whole system just degraded over time. (In some sence making it more parve, because today such people run after money and power, not after ideological kfiro anymore). Hallel is to G-d not people, PM, MK etc. Are you blaming G-d for this mess? I also have my orange bracelet still on. It's rather dirty, but so is the "leadership." Batya: If so, why not to say Hallel every day? Everything comes from Bashefer. Jameel: IMHO the comparison with Chanuka is invalid completely. Chashmonim started as tzadikim, and fell. Since they were tzadikim at the beginning, Chaza"l institued Hallel for the neys of the Chanuka. And what in your opinion was the "neys" of Chanuka that made Chazal institute the holiday and saying of Halel? The question of whether a wicked if Jewish government is better then no Jewish government at all is answered by the Rambam Hilchot Chanukkah Perek Gimel Halacha Aleph, the Rambam praises not only the Hashmonaim but the entire period of Jewish sovreignty including Herod and his son Agrippas. Regarding Shlomo Aviner, it is important to point out that according to the greatest rabbis of our generation in both the religious Zionist and Haredi worlds, it is forbidden to ask Shlomo Aviner regarding any issue, in that he has confused (at the least) the people regarding an issue involving Karet. Why is there no mention here of Rav Tal Shlita or Rav Shaar Yashuv HaCohen- both of whom have given directives to stop saying hallel on yom haatzmaut (not on yom yerushalayim).